TD-6 INTERNATIONAL CAT KNOWN AS "KOMMUNIST KAT"
ON MY KING OF OBSOLETE WEB SITE, I HAVE SET ASIDE A COUPLE OF PAGES TO TELL THE WORLD ABOUT MY CATS. 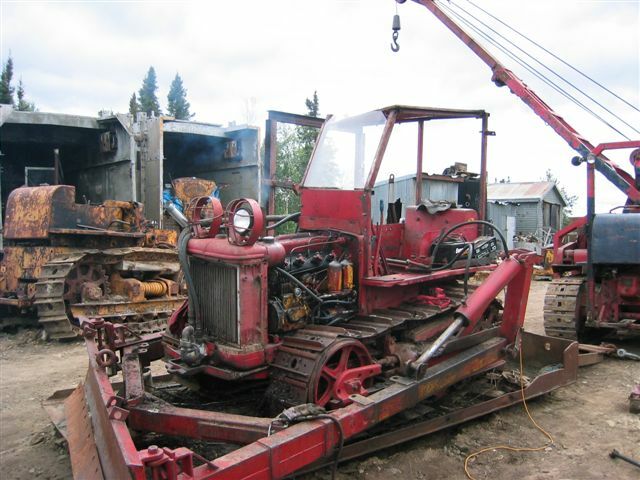 ON THIS PAGE I WILL TELL YOU ALL ABOUT THE TD-6 INTERNATIONAL CRAWLER (CAT TO US CANADIANS) KNOWN AS "KOMMUNIST KAT". IT GOT HIS (ALL MY CATS ARE BOYS) NAME FROM THE FACT THAT THE FINAL DRIVE ON THE RIGHT SIDE BROKE AND HE COULD ONLY TURN LEFT. SO THAT IS HOW THE NAME "KOMMUNIST KAT" STUCK TO THE TD-6 THAT WAS DRAGGED 90 MILES ON THE CAT TRAIN TO A PLACE I CALL THE "KINGDOM". I WROTE A 4 PART NEWSLETTER CALLED THE DOUBLE J ADVENTURES WHICH TELLS OF THE FUN WE HAD ON THE 5 DAY TRIP. 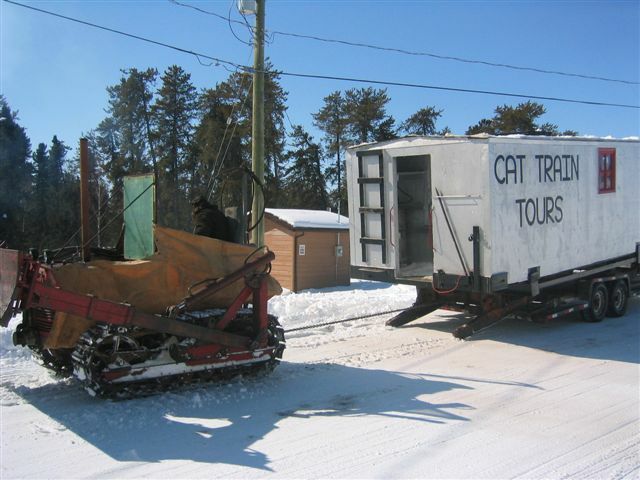 THIS TD-6 INTERNATIONAL CAT HAS ALSO BEEN A STEADY FEATURE OF THE RED POWER BULLETIN BOARD. 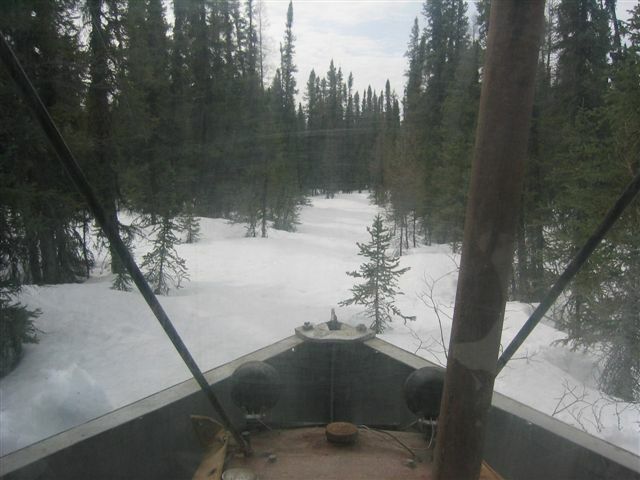 MOST OF THE REPAIRS ARE FROM REPLACING THE HOSES THE BEARS ATE, TO THE FINAL DRIVE REPAIRS AND OF COURSE THE TRANSFORMATION INTO BECOMING A WINTER FREIGHTING CAT. THIS HAS ALL BEEN DONE ON THE INTERNET SO THE WORLD CAN SEE WHAT IT TAKES TO LIVE IN THE GREAT WHITE NORTH. PLUS THERE IS NO PLACE FOR OTHER INTERNATIONAL CRAWLER OWNERS TO SEE THE WORK AND REPAIRS WITH THE TRICKS OF THE TRADE BEING DONE. SO I HOPE YOU ENJOY THE FOLLOWING STORIES ON THE "KOMMUNIST KAT" BECAUSE HE WILL A REGULAR FEATURE ON THE CAT TRAIN TOURS. "KOMMUNIST KAT'S" RESTING PLACE FOR OVER 5 YEARS WITH THE BLOWN RIGHT SIDE FINAL DRIVE. 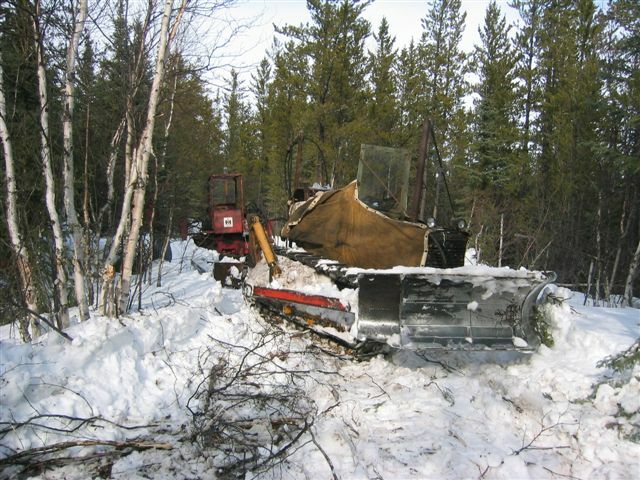 THIS IS WHERE IT BROKE ON THE BUSH TRAIL TO THE LODGE, 90 MILES FROM LYNN LAKE MB. I USED THE "FAMOUS BLACK CAT" TO LOAD HIM ON A STONE BOAT FOR THE ADVENTURE HOME TO THE "KINGDOM". THE DAY "KOMMUNIST KAT" CAME TO LIFE FOR THE FIRST TIME IN 5 YEARS. I WAS ABLE TO DRIVE HIM OFF THE STONE BOAT AND GO FOR A SPIN AROUND THE "KINGDOM" BUT ONLY TURNING LEFT BECAUSE OF THE BROKEN FINAL DRIVE. 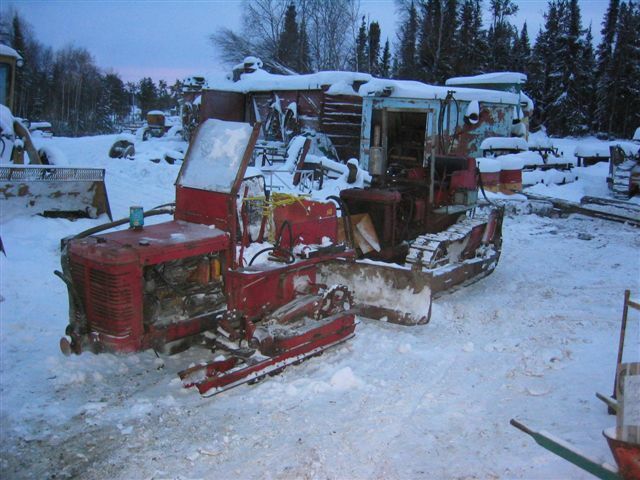 I USED THE OTHER TD-6 INTERNATIONAL CAT KNOWN AS "CURSE OF REVERSE" TO PUSH THE STRIPPED DOWN "KOMMUNIST KAT" INTO THE SHOP FOR THE REPAIRS OVER THE CHRISTMAS HOLIDAYS IN 2004. UPDATE JANUARY 2008 ON THE "KOMMUNIST KAT" IN THE LAST COUPLE OF YEARS. 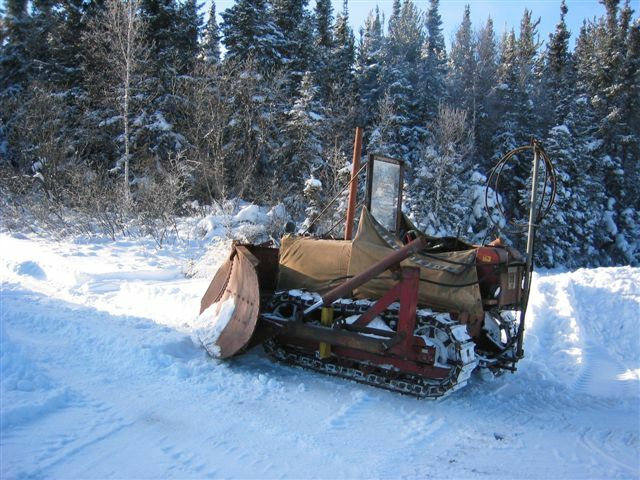 THE ANGLE BLADE WAS REMOVED AND A VEE PLOW FROM A 1929 LINN WAS INSTALLED SO THE LITTLE CAT COULD PUSH SOME SNOW. 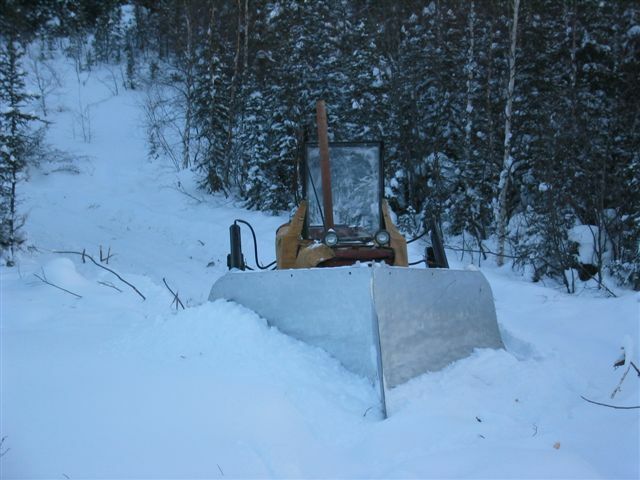 THE PLOW WORKS GREAT AND CHECK OUT THE EDEN LAKE ROAD BREAK.. BUT I CAN STILL GET THE "KOMMUNIST KAT" STUCK. 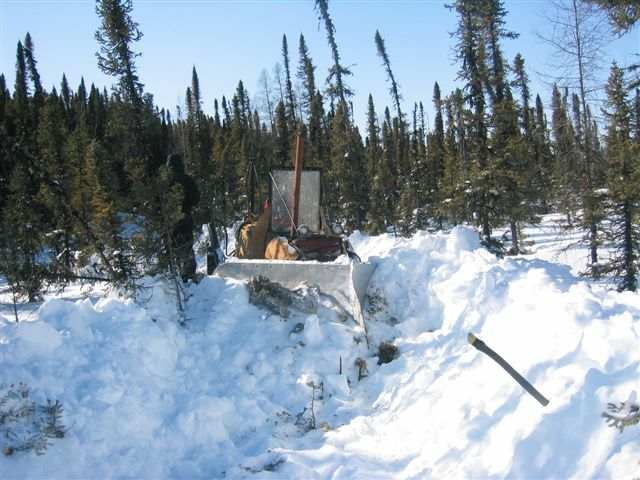 HERE IS A QUICK PICTURE OF PLOWING OUT TO A DRILL SITE. 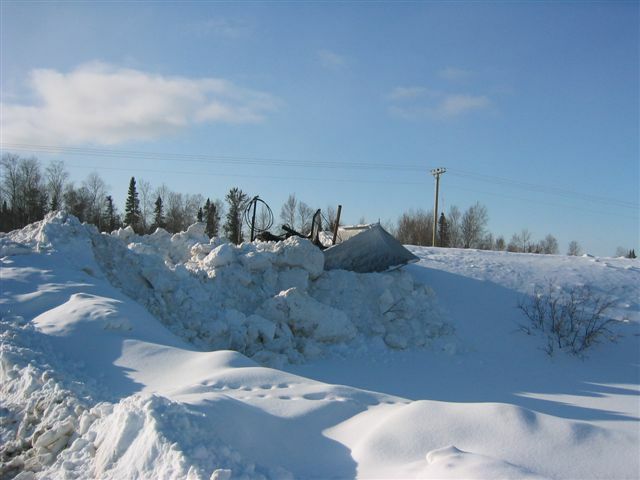 LOTS OF SNOW BUT THE VEE PLOW HANDLES IT NO PROBLEM.